A couple couldn’t book their music supplier until they had booked a venue. So to help build a relationship with couples getting married before they were ready to book the music for their wedding I built a venue guide so that there was a way the company could add value to their potential customers before they even thought about booking a pianist or DJ. 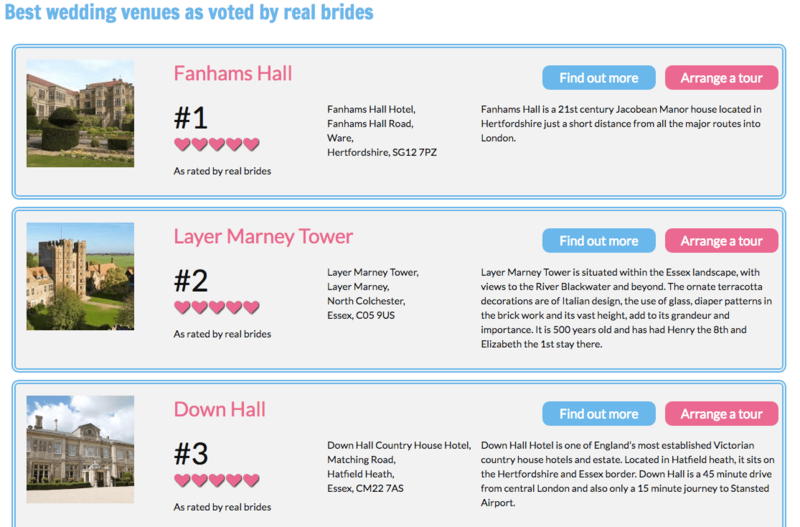 PianoDJ had built the Good Wedding Venue Guide to showcase the venues that they had worked over the last 10 years. When the guide got up to 70+ venues it was difficult to order the venues. The most important opinion you want when choosing a wedding venue is some one who has already got married there before. The project consisted of a number of different elements. It all starts with collecting reviews. Once the venues have received reviews the website uses those to rank the venues either in an overall leader board or one broke down by County or Venue type.